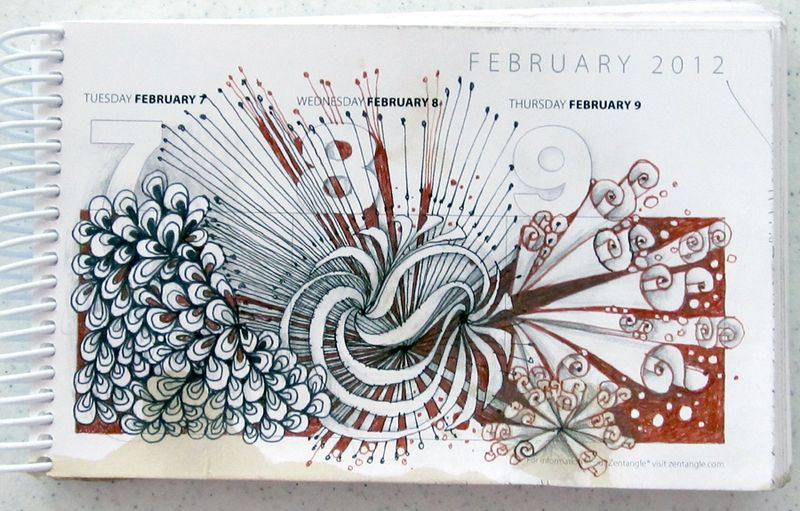 I've been really wanting to start playing with my new 2013 tangle-a-day calendar, but it's not the new year yet. Know what? I don't care. I'm starting anyway. 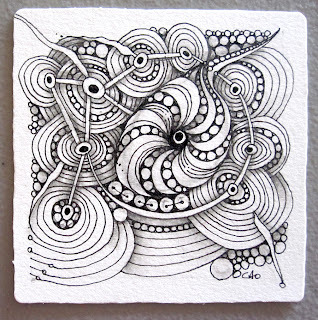 I did a little more DivaDancing, and then Sandra Strait posted this fun tangle, Kabbidge. I love the name and loved playing with it, especially the shading! Thanks, Sandra, for sharing that. 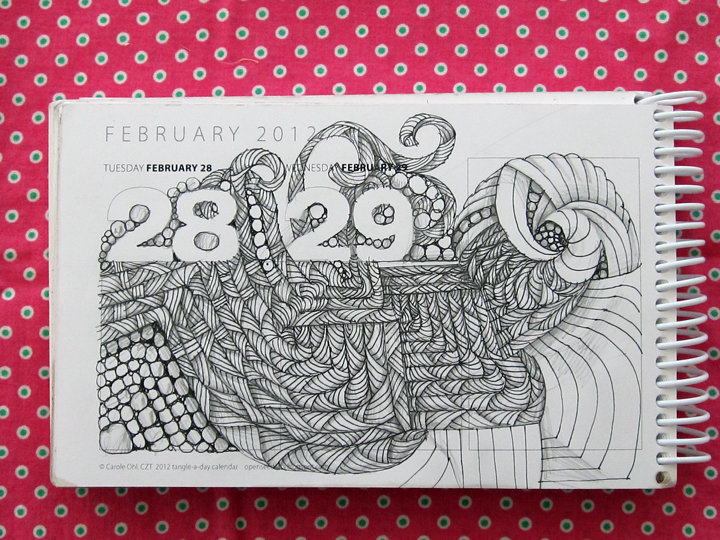 If you still need a calendar for your Zentangle practice, click the Calendar ad to the right. 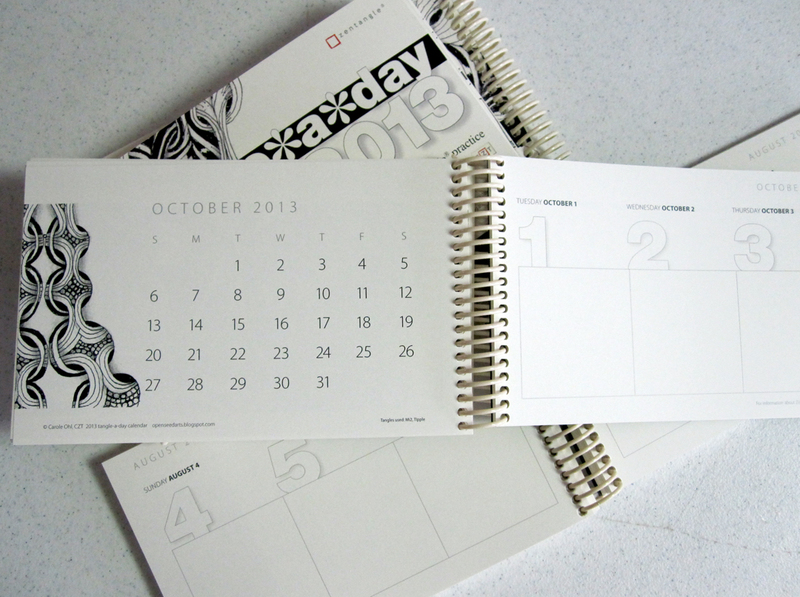 We only printed a limited amount, so when they are gone, we can't print anymore. 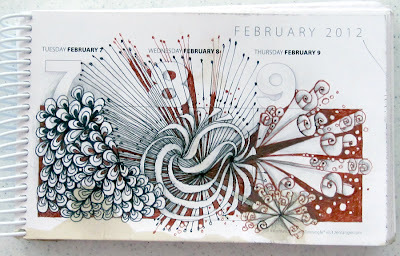 This year's calendar is printed on creamy ivory paper, and I have to say, the pen and pencil feel really nice on the new paper! 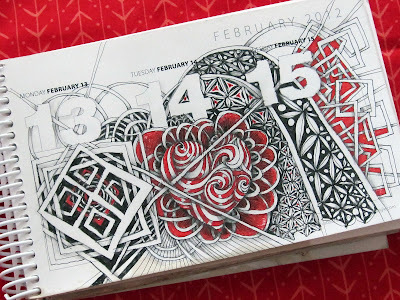 For the past 100 weeks, Laura has offered a weekly challenge for Zentangle lovers across the globe. Most of you are already familiar with her, I'm sure! And, I'm also sure you all share in the congrats to this tenacious, talented, funny, open and loving woman. 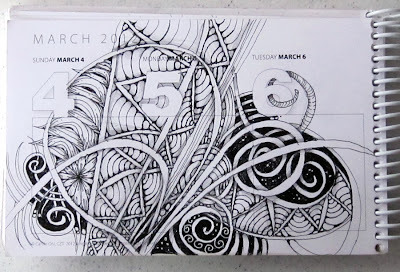 Even though I don't get to the challenges every week, I always visit her site to see what tangly fun she presents. 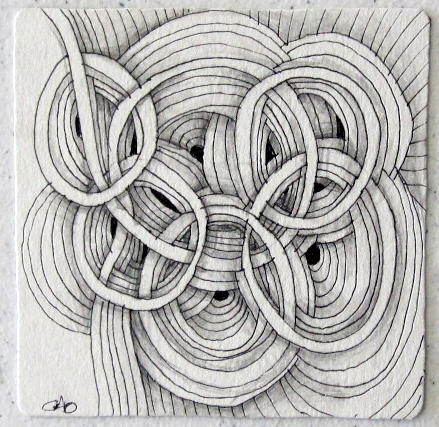 Often, the challenge is the only time I actually sit to do a deliberate bit of tangling in the midst of the business of life. I am always grateful, even if I didn't tangle that week. Just knowing she is there with her tangly torch is a comfort and a joy. 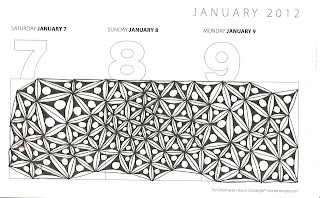 I intended to get right on this challenge, as it marked the 100th, and Maria and Rick presented a new tangle (Diva Dance) just to celebrate Laura's tangly mark. It happened that my son got engaged the day before and Monday nite we headed out for a congratulations dinner. I was struck by the little bit of synchonicity that Laura and Brad's engagement anniversary was that day, too. I got to the restaurant first to get a table. As I sat in the bar waiting (with a glass of Whoop Whoop Shiraz just for the celebratory name! ), I figured this would be the time to pull a tile from my purse and have some fun. The bar was dark, and all I had was a .08 pen that was on its last drop. I also had my phone to try and see the new tangle steps. I really didn't know what it looked like until I saw it in daylight the next morning. Just goes to show, that it's not what it looks like, but how it feels. I had a LOT of fun with this the first time out. Today is Sunday. I'm sitting quietly in the bead store way before opening time. I have tons to do, but I couldn't let the week go by without another go at Diva Dance. I tried all the steps, and as in dancing kind of dancing, I usually veer off the sequence, as I can't remember the steps sometimes. 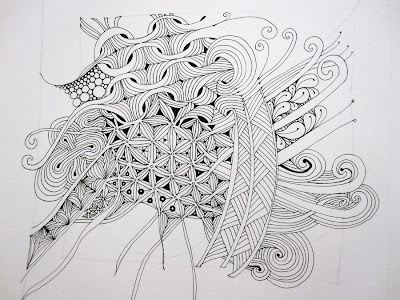 BUT in true Zentangle style, the veering off is part of the fun! The what if's are always part of the process and I love to let them take me wherever they say to go. 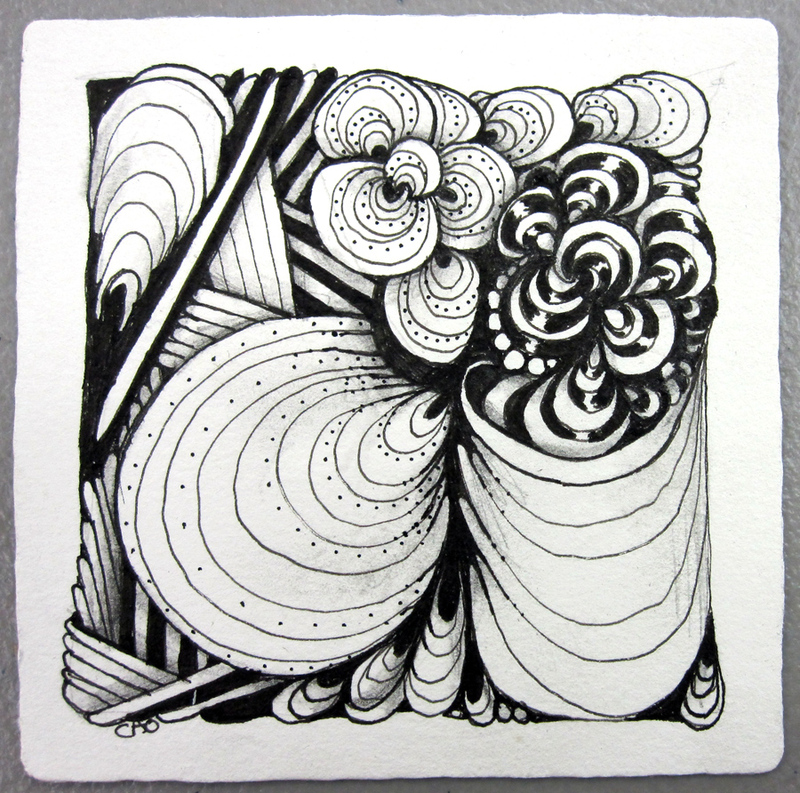 Thank you Laura, Rick and Maria for another moment of the gift of Zentangle. 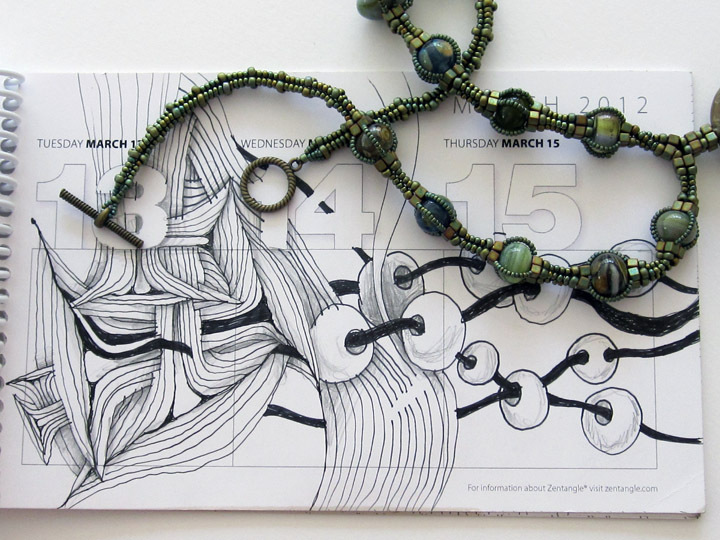 Yesterday was our first official scheduled Zentangle class at our new bead store, Stash. 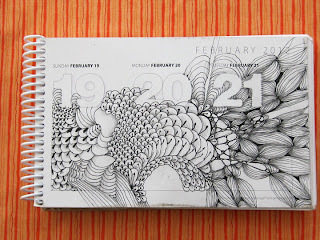 My tangly day began in the morning. 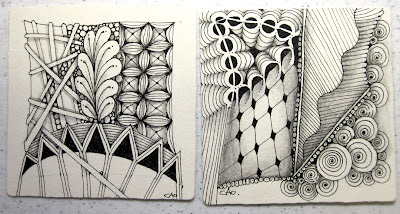 A friend invited me to come to her home where nine women wanted me to talk about Zentangle. 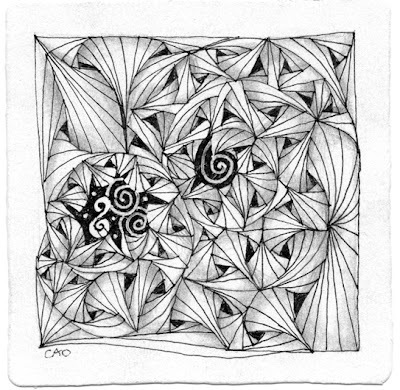 It just so happens they were meeting the morning of the first day of our Zentangle class, so later that afternoon a couple of the ladies joined the afternoon class. The class was taught by my friend and fellow CZT, Peg Farmer. 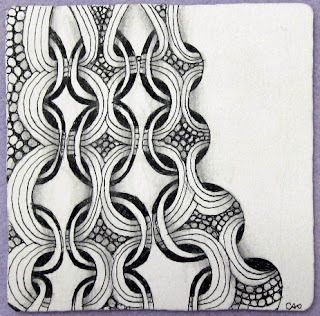 Peg is an awesome teacher who also teaches at the University of Dayton's Lifelong Learning Program where her Zentangle classes are always full with a huge waiting list! Since we were having the class in my store, and we are officially closed to the public that day, I got to sit and take the class from Peg. 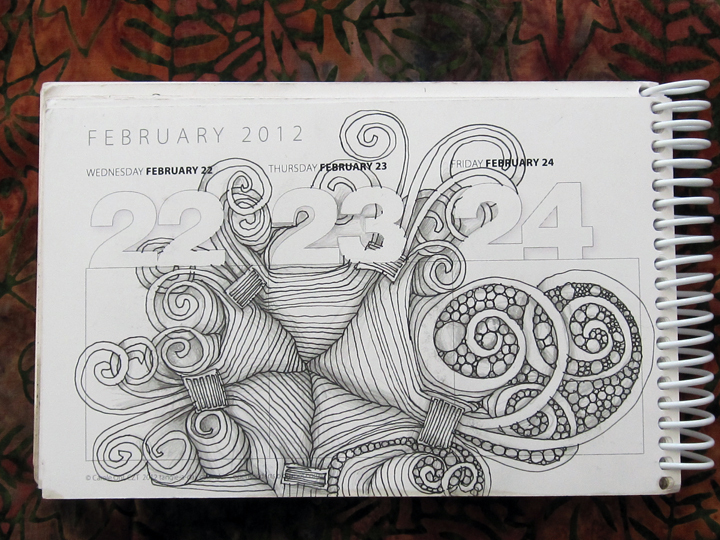 It's been a while since I've sat for that long and tangled. 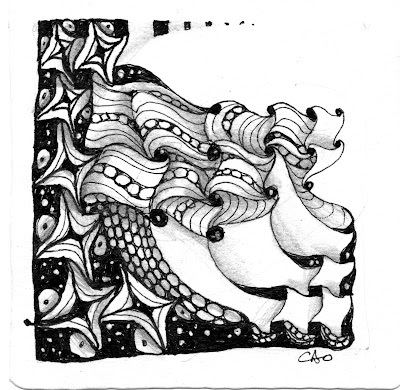 What was especially nice was that the tangles were being directed by someone else, which really takes the thinking/choosing aspect out of it. How relaxing!! Thank you, Peg, for a wonderful class. Can't wait for next month when we do it again! If you are in the Dayton area and would like to attend a Zentangle class at Stash, click here. We also offer private classes for individuals or groups. It was very windy last week and I think I'm still feeling the aftermath. When winds come, it seems to accentuate and remind me that things are always moving around, changing and shifting. 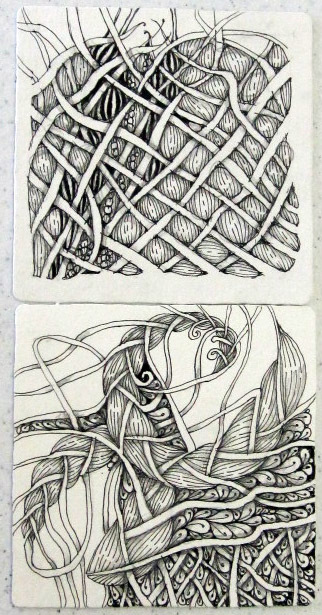 This continuing episode of a tangle feels very windy and changeable. 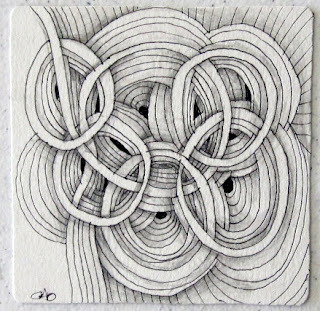 As I move along with the next tangle sitting on this one, we shall see what happens. 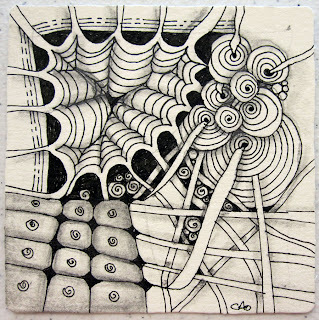 This past weekend I had the awesome treat of tangling with some of my CZT buddies. Lesley Scott-Gillilan and Angie Gamble came from Indiana and joined Peg Farmer and myself for a little beading in the morning, and tangling in the afternoon. 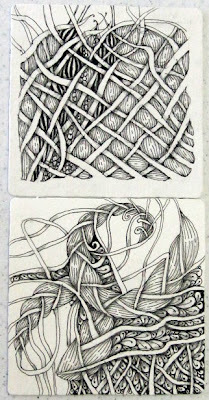 Our friend Denise also joined us at the shop for a bit of tangle time. I am so grateful for the chance to lay the bead shop details aside for just a little bit (as much as I love it!) and just make black lines on a white paper. Slow and easy... nothing to finish, nothing to produce, just lines on a paper. Sigh. Smile. Relax. What a treat. Even though I know that the practice of Zentangle is a relaxing stress reliever and just plain fun, it seems that in the past few months I need some other people to set the experiential stage to remind me of that. So thank you, ladies, for your little nudge that gently pushed me into a lovely afternoon. 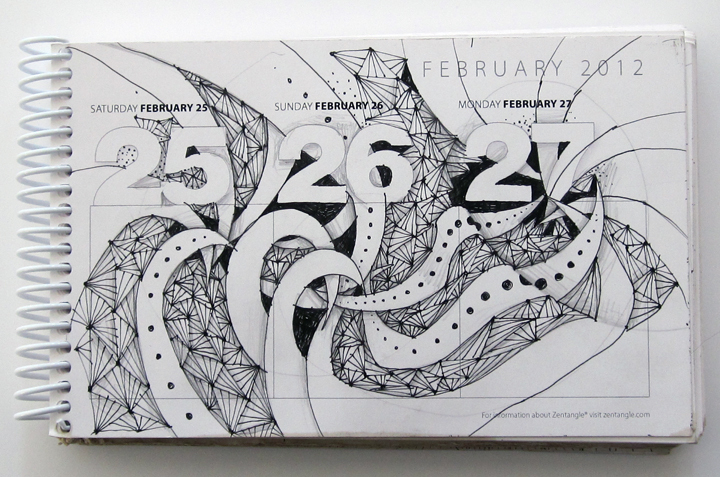 PS: we are getting the tangle-a-day calendar printed soon... stay tuned. Yesterday I learned that I had another roofer's nail in one of my car tires. This is the second one in 6 months. So, the best laid plans of the day completely turned around, and I was gifted with sitting at the tire center with nothing to do but tangle! What a lucky girl, and I MEAN that! Lately my days have been quite full, and a little tough to set aside some time for tangling. I'm slowly seeing times in my new schedule where I can fit it in, but this opportunity was an added bonus! 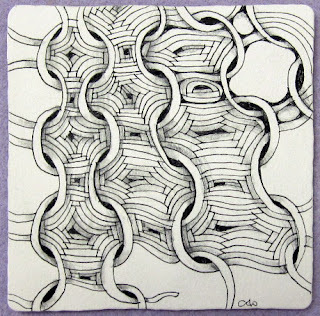 Plus, the Diva Challenge presented the tangle, Mi2 (created by CZT Mimi Lempart), which I did try a while back and loved, but hadn't played with it since. And, since I'm STILL into the aura play, I couldn't resist adding it to this tangle. And of course, I had to 'puf' it. I was a little disappointed that they had my tire fixed in record time, and I didn't get to sit and finish, but when the day was finished, I continued the first, and did two more before I went to bed. I have to say, I slept really well!! I love this art form. Competition is tricky business. The world is full of it. Sure, even though we tell our kids that it's not whether we win or lose, it's how we play the game, we still set up score boards and rosters that glorify the winners. It's natural, I guess, but we do have a choice in our own perception. If we like competition, well, then by all means, participate in the game! If we feel that competition is inappropriate in a certain arena, then each person can make that choice to reconcile that in themselves. "Would you enjoy a book better if you could read it faster? Perhaps you could read more books, but at what cost? When you can afford to read at a comfortable pace you can savor a turn of phrase, look up a new word, or gaze into an unfocused distance as you imagine a setting and see yourself in it." I had a fun time with my tile this week. 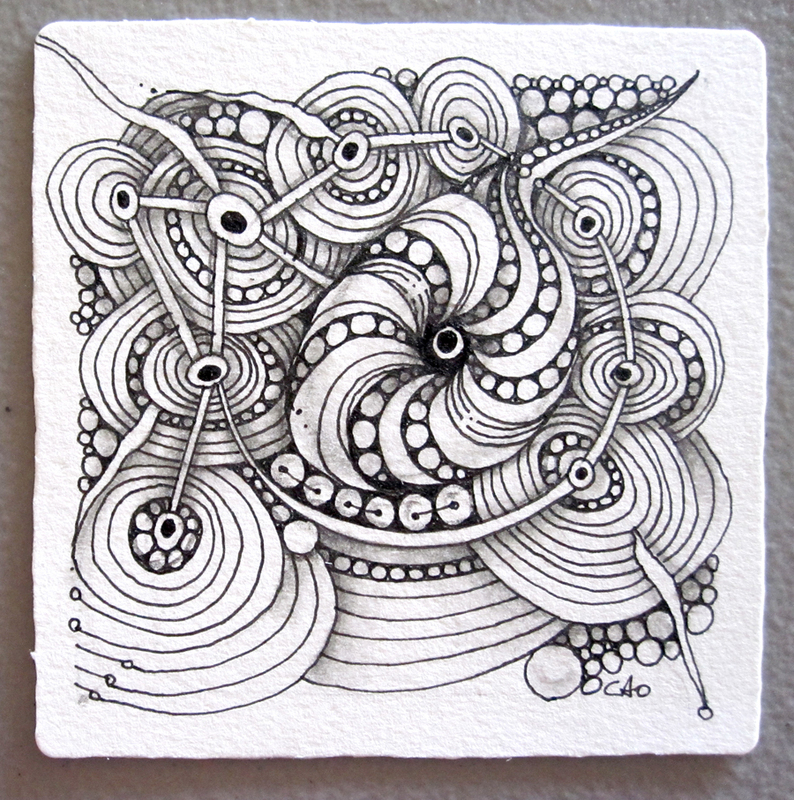 I was really inspired by Erin Olsen's take on this week's challenge, and I love the Auraknot vibe, so my interlocking circles had me deliciously dizzy with auras. FUN! 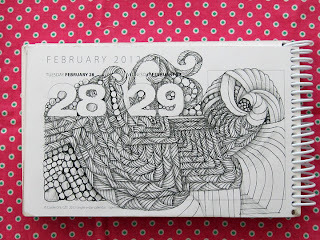 Thanks, Rho, Erin, Laura, Zentangle, and all the beady and tangly peeps who joined in the inspirational fun of the week! Lately it's taken a lot to get my nose out of the bead bags. Starting the new bead store has been an invigorating, but intense endeavor. 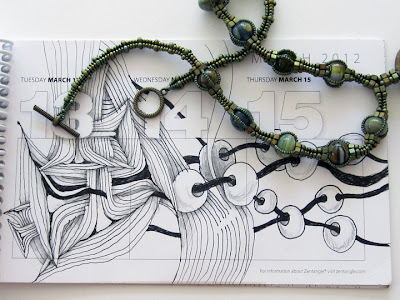 I have to admit that when I saw Zentangle's first invitation about the tangle that is now called Auranot, I was really intrigued, but alas, there were beads to count. When I saw the video on Laura Harm's blog, I knew I had to stop everything and do it. 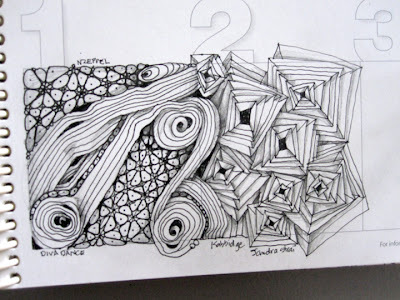 I was also inspired by the group of new Zentangle Intro students from our class the day before. 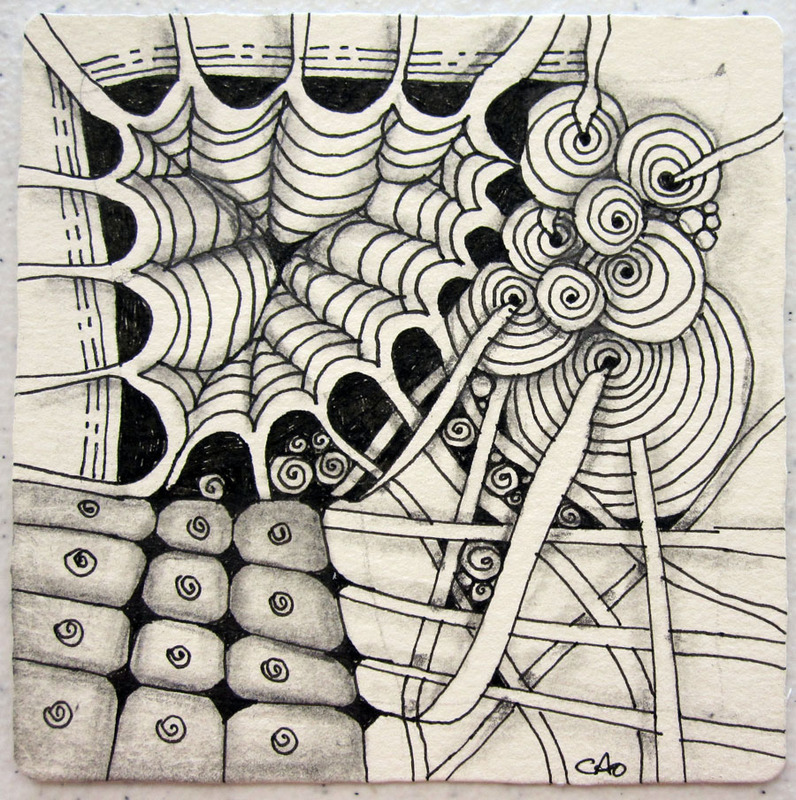 When I woke up this morning, before I got out of bed, I grabbed some tiles from the nightstand and started to play. It was tons of fun to stay in bed and tangle with all the kitties patiently waiting for breakfast. After three tiles, they finally got to eat. Auraknot has now grabbed me completely and I've spent the whole morning playing and wandering my little pen over many tiles. WOW. This is more fun than I thought it would be! It took a little concentration, and at first I wanted to go in so many other places before I really 'got it.' I think that may be because I haven't tangled in a while. Once I started, my right brain was like a kid who had been cooped up in the house, finally gets to play outside, and doesn't know what fun thing to do first, so tries to do it all!! FUn Fun FUN!!! Let's go let's go!!!! Once I settled into a quiet, less spastic place, it was truly a calming and lovely time. I could feel myself getting more and more focused on each line as I made it. I could go on all day. I found myself adding more 'ribbons' to the outer edges of the stars, some of them curling around on themselves, but carrying their aura just the same. 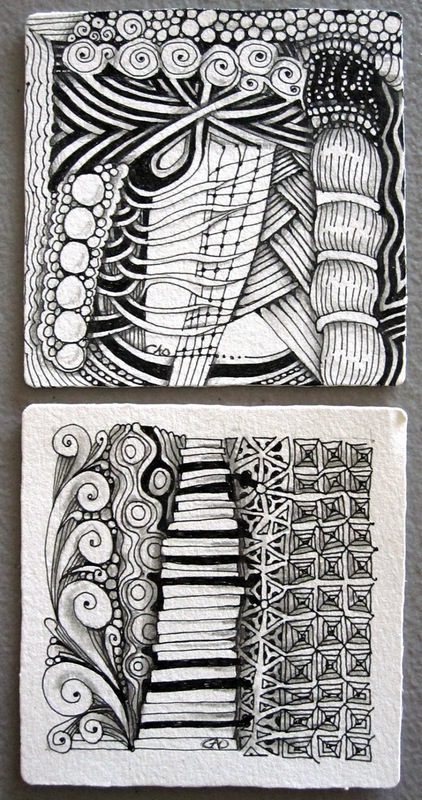 Thank you, Zentangle. Thank you Laura! Hey everyone, I realize it's been 40+ days since my last post. In the past month, Daved and I have made a decision to open a bead store in Dayton. It’s a long and wonderful story of how we ended up as stewards of a new place, but that’s for another day. 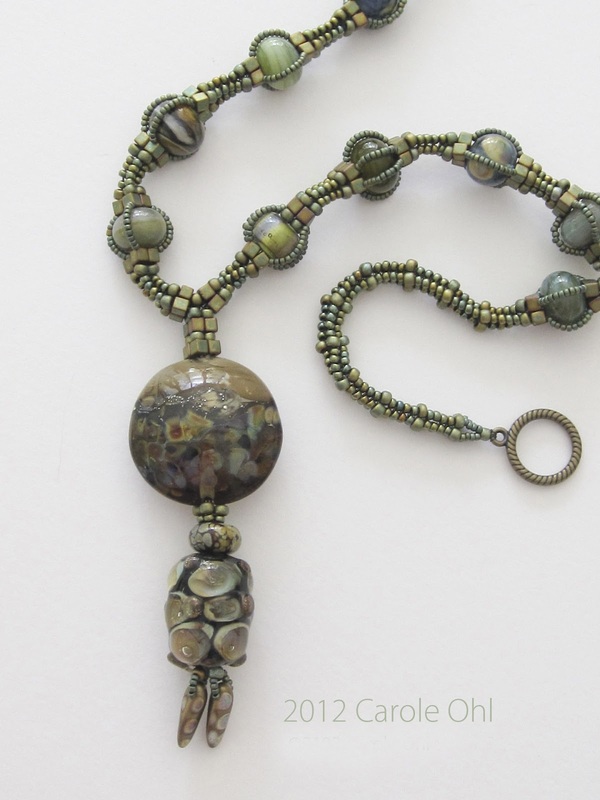 The store is basically in existence for one reason: to give the Dayton bead/jewelry making/playing community a place to gather, learn, teach, party, relax, hang out, and yep, buy beads. We like our beads! What does all this have to do with Zentangle? 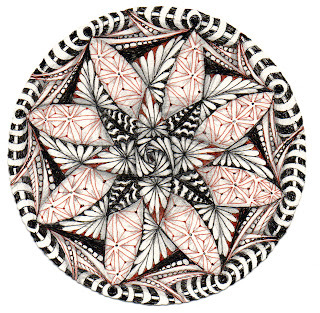 I know without a doubt, that if not for having been involved with Zentangle, it might have seemed impossible for us to take this on. Each day I am aware that no matter what decision needs to be made, it’s possible for it to come from an allowing and open space rather than a constricted “should”. The whole place is being designed one wall at a time, one piece of furniture at a time, one logo at a time (we tried so many!). The space is also being added to by lots of participants who are committed to helping it become something inspirational and meaningful for all who use it. Whether it's new chair covers, or bathroom decorations, or where a table might sit, each of these elements are cared for with an intuitive heart and eye by lots of people, so that each piece and placement connects to what has come before it. I can't tell you how many "visions" I've had for this space. They have all changed, and it looks nothing like I pictured it before we began. This is the thrilling part! Letting it all go so that it can become what it is meant to be. There is a plan somewhere that is not mine. It feels like we are all paying attention to what that might be, without knowing exactly what it is. We don’t know when the shop will open. 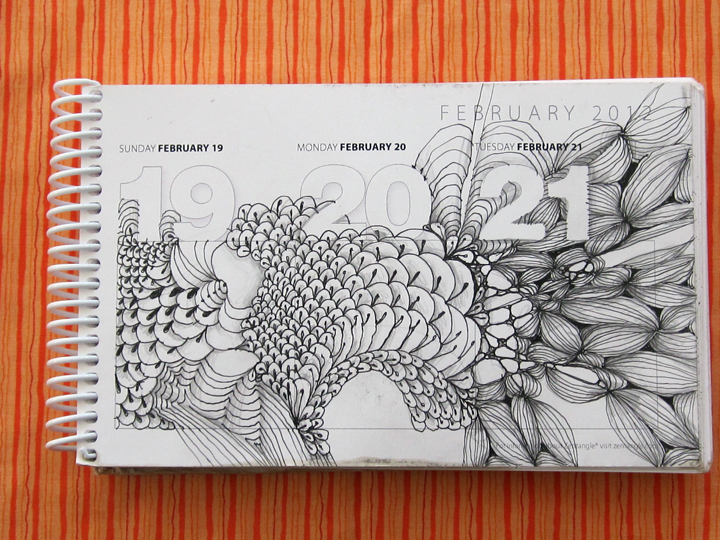 Of course we have a date in mind, but we’ve had other dates in mind that didn’t happen. We are working diligently to move forward, one step at a time, feeling our way to what the next step is. So even though it's a bead store, it's so much more than just that. 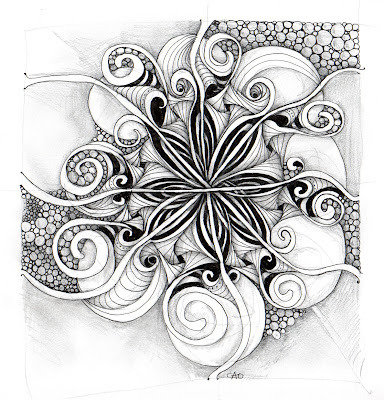 I am grateful for the experience, wherever it came from, and for me, Zentangle has been the cherry on top of that experience. 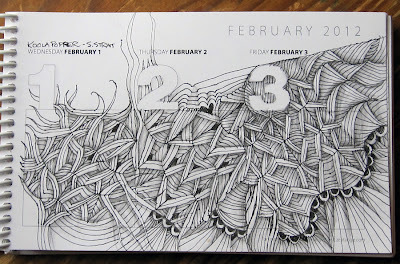 If you want to peek at the process, we are documenting our progress on our new blog. 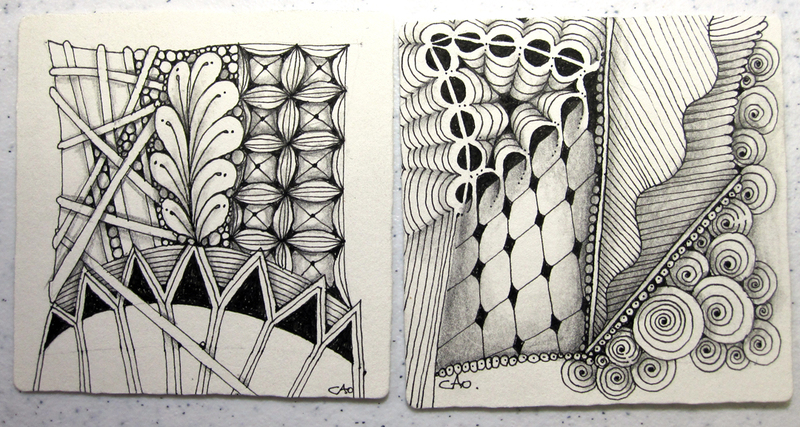 And I promise, that even though I may not have time to do tangly posts here at this time, I am living Zentangle every minute! The art of Zentangle® naturally includes the art of paying attention. 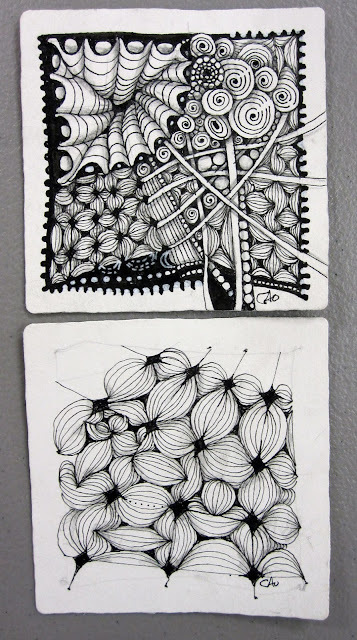 We watch our hands and pen connect to the paper, making our repetitive marks in a deliberate way. 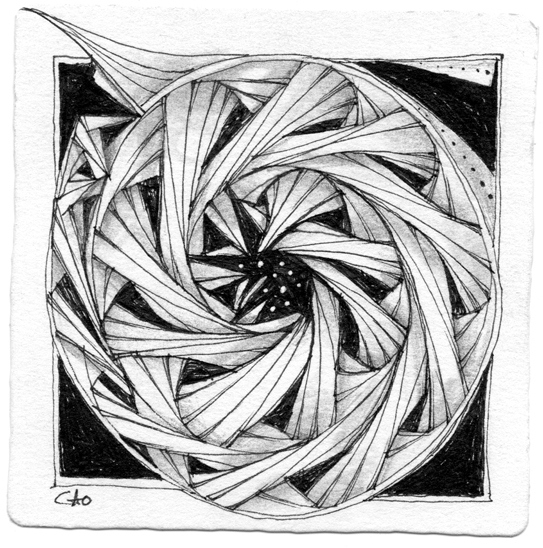 As we spend some time doing this, our focus becomes more refined, and our being becomes steeped in the moment itself. Do this every day and see what happens. If you you care to hear more of Dr. Dispenza, here is a video, chock full of amazing ideas. Some days there is nothing like a nice straight line to get my attention. 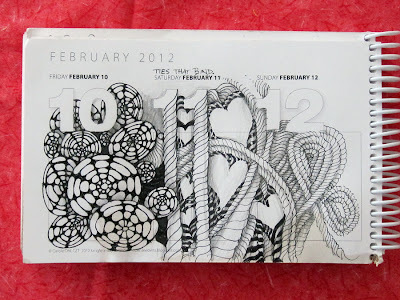 The rhythm of each line and where it wants to step is a fun dance for me, so February 16 was such a dance. 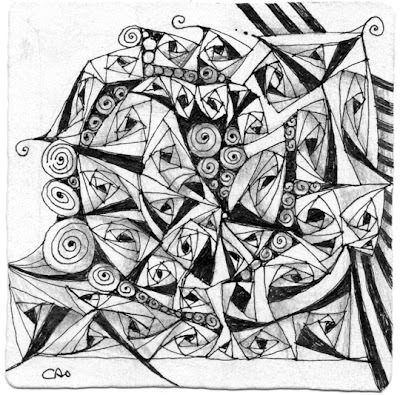 The tangle is one of Zentangle's orginals called BB. I chose this for a friend whose birthday it was, and who also shares those same initials. I don't often do BB, but everytime I do it I wonder why I don't do it more often! I love this, especially layered along a string, and using it to fill in the sections of the string as a monotangle. The other two days were just random designs, although I'm sure they are tangles somewhere. I just didn't consciously know what they were. I also love shading as an exercise in attention. It gives me a chance to play with the lines all over again, hunting down the things that are behind and in front, or finding edges of a long forgotten string. Paying attention is fun. Last weekend was spent steeped in big love. A beloved family member left the planet, so we all gathered to remember his life and share the connections we had around him. Even though it often looks like people float near to us, and then away from us, the ties of love that bind us were evident in the celebration. 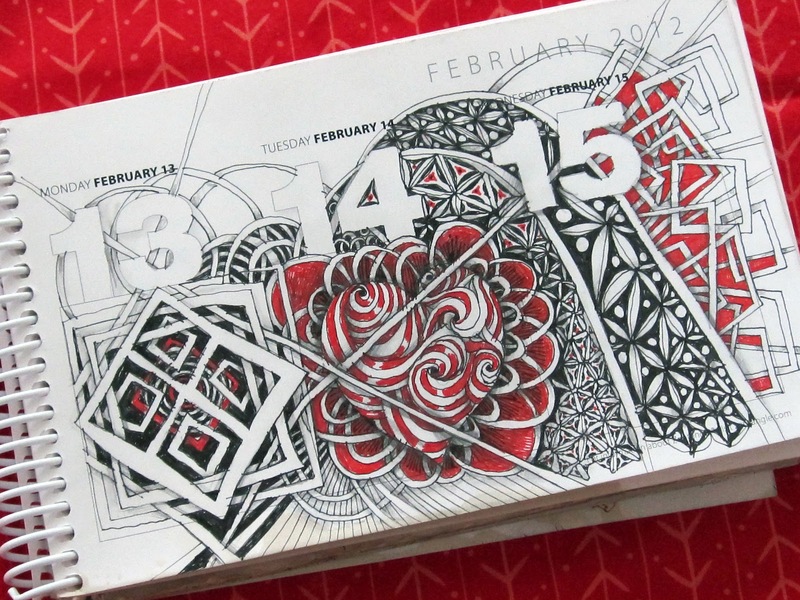 It seemed fitting that the next few days would bring us Valentine's day. 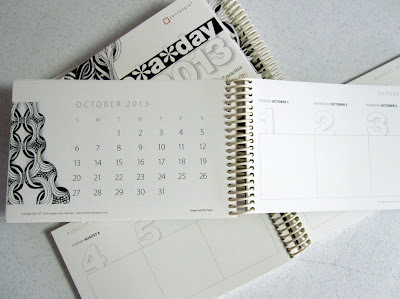 By Monday I had already done my Diva Challenge before I started in on my calendar entry. I had unexpectedly fallen in love with the square logo presented in the challenge, so I just couldn't help but spill that love again onto another space (Feb. 13). When I did the Fengle heart on the 14th, I figured I might as well add some red to celebrate the holiday. I loved the feeling of the red pen (a Pilot extra fine Precise V5) on this paper, so I backed up and did a little red on the 13th. Then I realized I still loved playing with open boxes that floated behind each other, so today's entry was simply that, coloring the open spaces with the red. 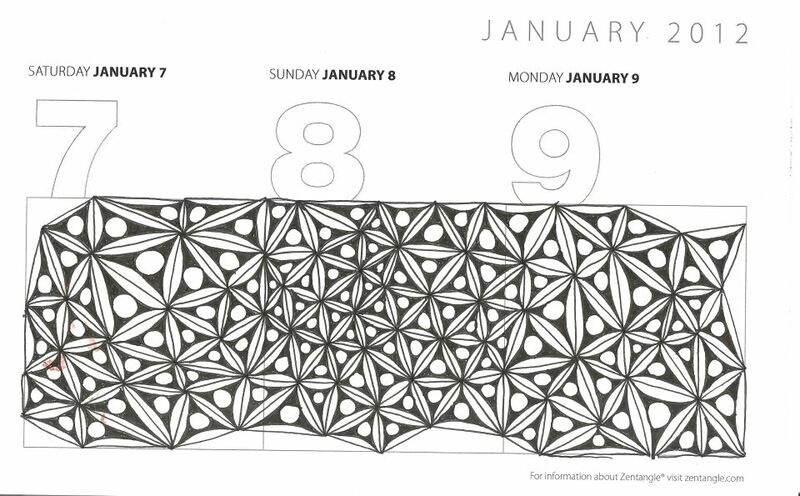 The tangles in between were inspired by CZT Cari Raboin's calendar entry for Jan 7-9, (pictured here) that she posted on Facebook. I was so in love with how she changed the size of her tangle, that I had to try a little of that too! I first thought Cari did Tripoli, but then I thought it might be Fife, so.... the one on my Feb. 14th is Tripoli, and the 15th is Fife. 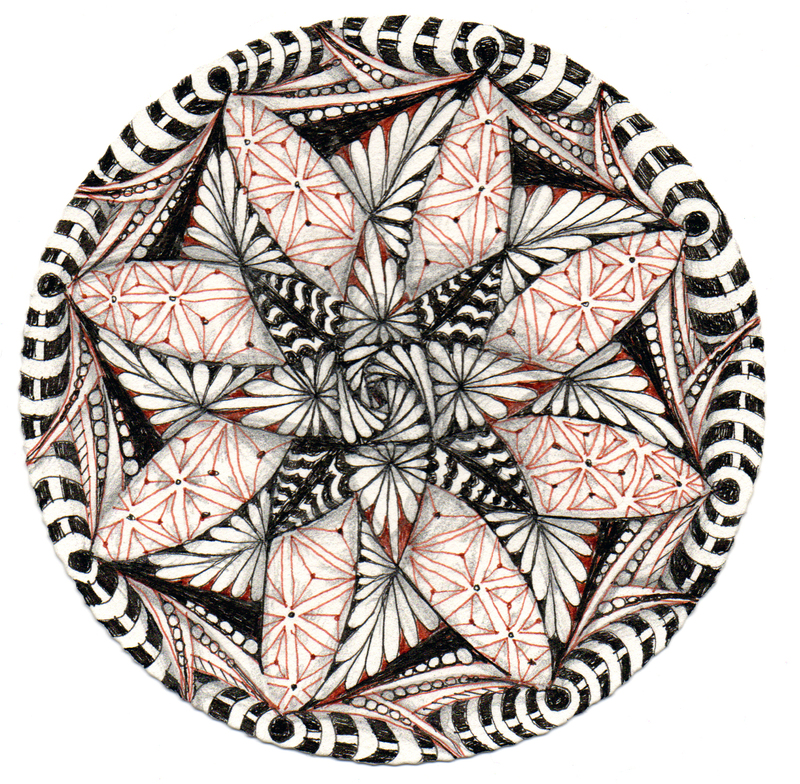 Thanks to a loving family, CZTs Diana Hirsch, Laura Harms, and Cari Raboin, and of course, Zentangle:) I love how love spills over. To dillydally is, by the Merriam-Webster definition, to "waste time by delaying." 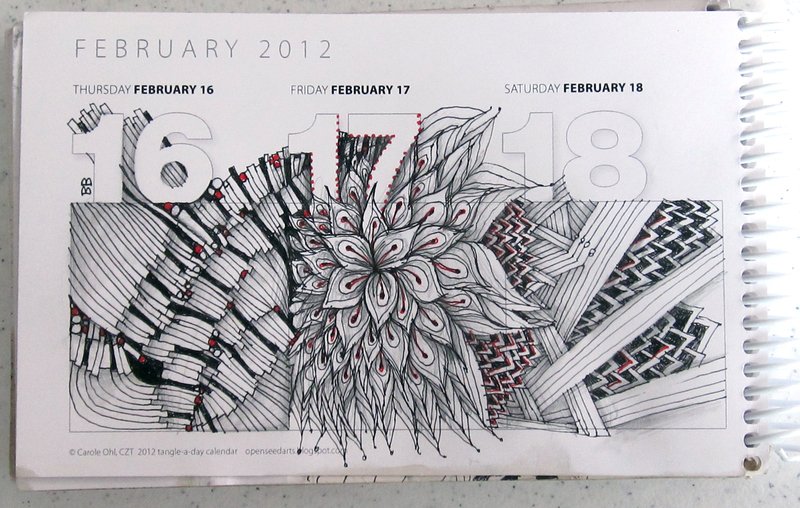 Yes, it was a day of delaying some things that maybe should have been tended to....like taxes or cleaning the basement. And it is, after all, a Monday: time to get moving. But it was one of those Mondays that came behind a rather large weekend, so it was a little tough to get back in the saddle. 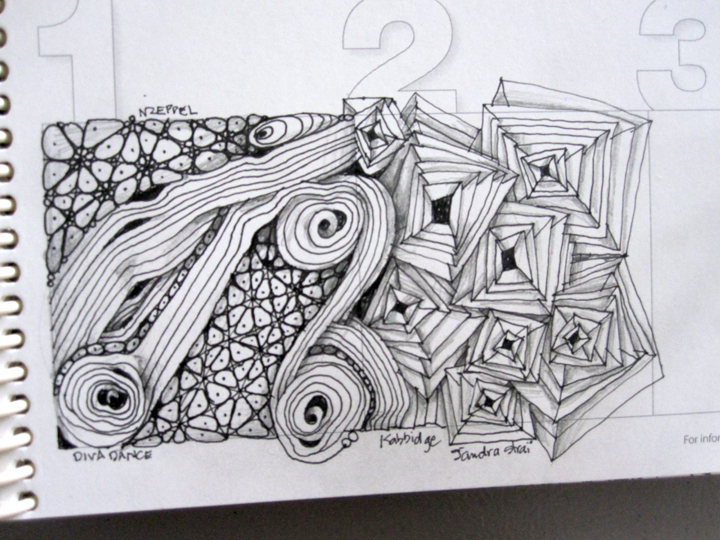 I do make a point on Monday mornings to visit the Diva to see what she has waiting for us in the way of a big juicy Zentangle® challenge. This week's treat was offered by a guest challenger, CZT Diana Hirsch. Diana used her challenge to raise awareness for The Four Diamonds Fund. Using the organization's logo as a string, and then using only diamond-esque tangles to fill the string, was a particularly challenging request for me. Most days, making a diamond shape just doesn't fit my natural rhythm. I don't know why it's so different than a square, which gives me no trouble. I approached the challenge with a ho-hum, since I had a preconceived notion of my enjoyment level with drawing diamonds. Thinking back, that sounds a little arrogant to think that I should know beforehand what I will and will not connect to before I even start! Oh well, not a surprise really. I have my story and I'm sticking to it (ahem). The first tile I did was pretty simple. I wasn't into it for a very long time. All those straight lines were not doing a thing for my fun level. Wow how arrogant again, to think that the lines of my pen were supposed to entertain me. geez. 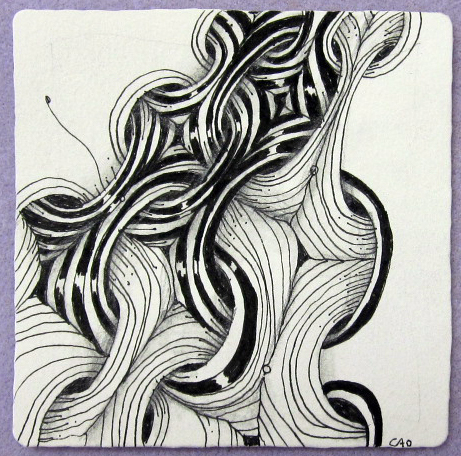 ok. Moving forward, the magic of this art form once again took over, and I found myself looking at this tile in a more open way. The more lines I made, the more open I felt, and the more that little creative voice spoke to me about putting other little lines here and there, and where to put some shade. Hmm. I should have known this would happen. If I just shut up to myself about what I think I will like, I might just open myself up to something new and miraculous. After the first tile, I was anxious to try another. I spent lots of time on this second one. And, by Merriam-Webster's meaning, and maybe some other people's standards of what should be done in a day's time, this dillydallying was getting out of control. I dillydallied and probably even shilly-shallied too! It was great fun. Thank you, Diana!! And thank you, Laura. And also thank you to Rick Roberts for his post for the day, that I'm sure had something to do with allowing myself to see beyond my expectations, and move forward into something much more wondrous! As father-in-laws go, Glen was wonderful. As a grandfather, the best kind. These are the ways I knew him. Glen passed on Tuesday and so was on my mind all week. 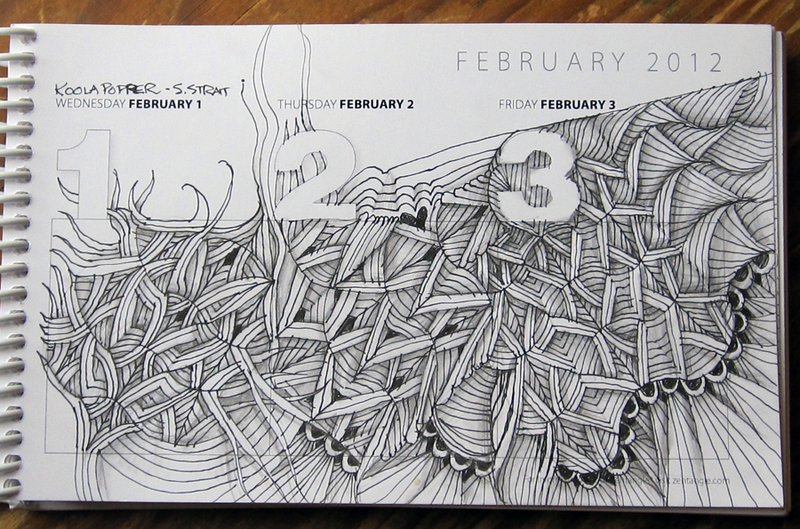 When I looked at my calendar page for the last few days, it felt very joyful to me, although the week was laden with sadness for all of us who will miss Glen. I suppose that what came out onto the pages was the other side of the sadness... a gratitude and joy for the life of a wonderful person. Thanks, Glen. I spilled my coffee yesterday morning, so there is a bit of extra color a the bottom of the page. It's my wish that we accept and appreciate the unexpected color that each day brings. 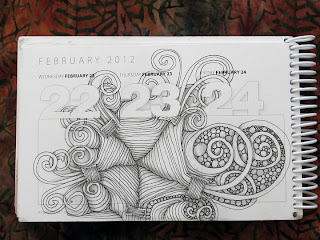 Every Monday morning I visit Laura Harm's blog to see what Zentangle® challenge she offers us for the week. Her commitment of time, love and talent is astonishing, as she has a plateful of stuff in her life that might make most of us forgo the effort it would take to keep up this weekly blog post project. For that we are all very grateful. Which is why it is with so much joy that I say, Congrats, Laura on being voted Top Blog of the Top 100 Teaching Blogs of 2011!!!! 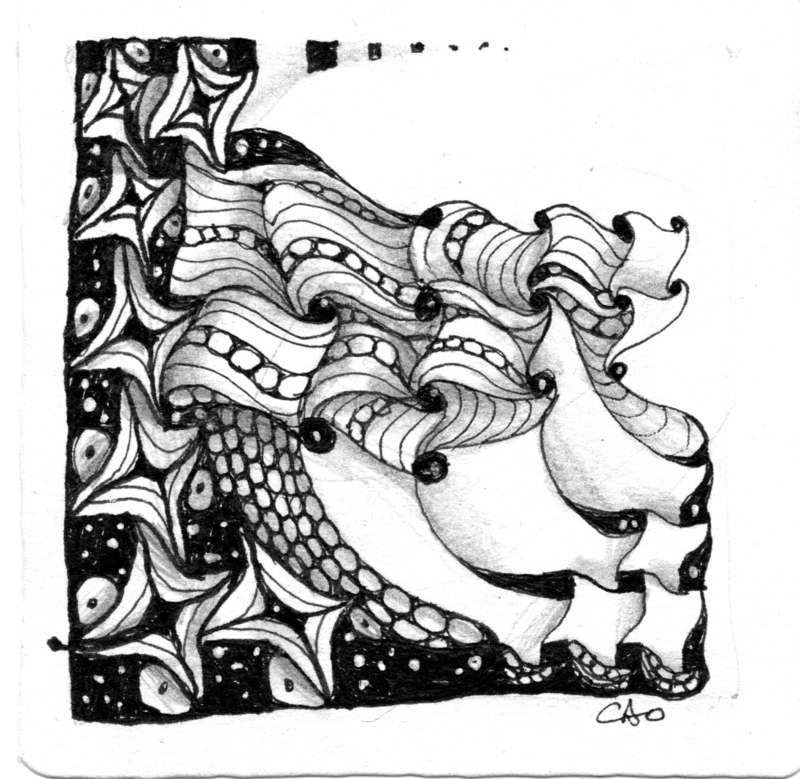 You rock the Zentangle, and the Zentangle community by inspiring us every week to participate in the challenge. 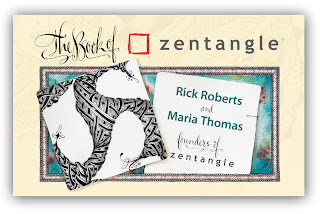 Whether we post our challenge responses or not, there are hundreds of people who look forward to your Monday morning surprise, each one finding a corner of joy for themselves in the world of Zentangle. Big hugs and kisses to you! 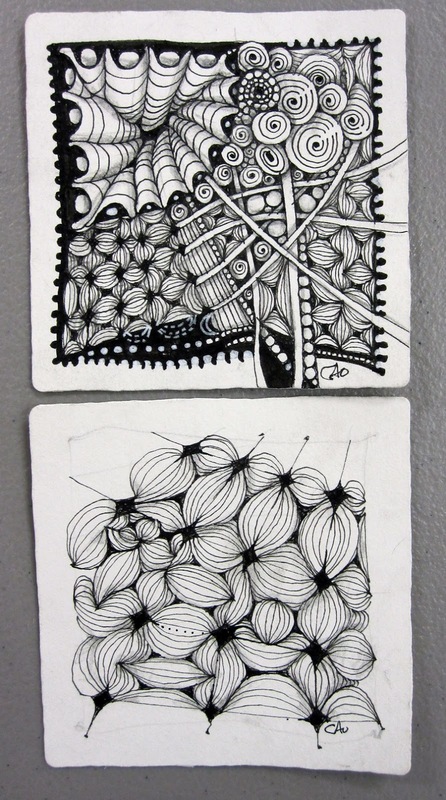 Thanks, Laura and thank you Tricia for sharing your beautiful and playful tangle with us.